The problem with most budgets is that they are static (last year + x%) and don't adequately allow for the unknowns (eg, price increases/decreases, competitive openings/closings, new programs by you or your competitors or, of course, the weather). A more helpful approach is to review the performance of all your key metrics dynamically, ie, review results on a rolling-week trend basis. Very simply, it means looking at results for this year (TY) vs last year (LY) covering 18 weeks: the latest week, the previous 4 weeks, and the prior 13 weeks. Thus the term, the 143 Report: 1 week vs 4 weeks vs (1)3 weeks. [We found after a month that users abbreviated the report from "the 1-4-13 report" to the "143 report" (people prefer easy-to-say, brief report titles)]. The report is updated weekly. This illustrative report shows trends drawn from a retailer's clubcard data. Sales are on row 3; the components that create the sales are in rows 4-7; while row 8 identifies growth before including the impact of the change in the average selling price per item sold (ASPI), seen in in row 8. The ASPI is affected by two factors: price and sales mix changes, the latter often affected by the former. Reading this 143 Report from right to left (the most recent data is in the first column), we see that the trend in member sales over the past 18 weeks is positive, from a 3.1% YTY gain in the first 13 weeks (to Mar 29), to a 3.4% gain in the next 4 weeks (to Apr 26), to a 3.7% gain in the latest week (to May 3). Certainly, a trend every marketer (and CEO) likes to see. Now what about the details? Row 4 shows where some of those sales gains are coming from: we are reducing the rate of customers loss experienced in the 13 weeks to Mar 29 when 1.2% fewer members than in the same 13 weeks last year. In the following 4 weeks this year, we had reduced that loss gap to 0.7%, and again in the most recent week's comparison with last year to 0.3% down. Our member trend is positive in that the negative gap kept shrinking. Our marketing and operational plans are working! On the other hand, we see in rows 5& 6 a common offset to improving customer numbers: a slight drop in the average weekly visits per customer and in their average number of items purchased per visit. In the case of new customers this is usually because they are still shopping a lot elsewhere and are not fully familiar with us yet; in the case of those customers in the process of leaving us they often slowly reduce their visits and spending over time. The net effect of the changes in customers, their visits, and items bought per visit, is seen in row 8, the change in YTY sales over the trend period less the impact of price changes, the ASPI (row 7). 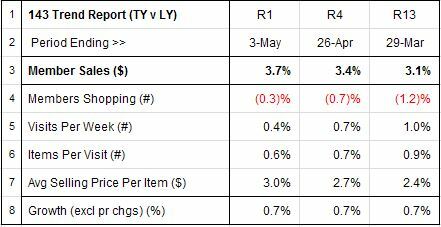 For example, in the latest week, YTY sales were up a welcome 3.7%; alas, 3.0% of that increase came from the increase in the ASPI (ie, price, size, and item mix changes), meaning only 0.7% (3.7%-3.0%) of our sales gain came from the "hard" marketing elements (actual customers, their visit frequency, and how many items they buy) which is the real indicator of how much customers "love" us and what we offer. In this example, this net hard gain of 0.7% shows no change over the 18-week period even though YTY sales show consistent improvement. This was portrayed deliberately, to show that just looking at sales is not enough to understand the health of a business. The underlying sales components must also be monitored so that when there are problems in sales, knowing where to look first will be clearly obvious. This 143 approach I have seen helpfully applied to many metrics in business: from departmental data to labor productivity. Its beauty is its simplicity, both in its setting up and weekly production (readily available data) and the ease of seeing at a glance which way the business is currently trending. It has a stable base because it covers 18 weeks (one-third of the year) of same-week data this year vs last year that captures the changes in seasonality trends. Its two prime benefits are that it allows a manager to compare current performance with her own past performance and also one store manager's growth (or decline) trends with those of his peers (which is not only instructive but also a great self-motivator) two differences that make 143 reporting superior to traditional actual vs budget reports.